y baby girl has great big dimples. 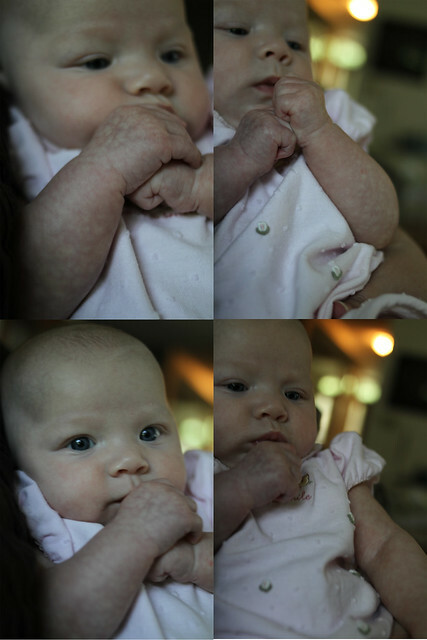 She also loves to nosh on her fingers! So while I'm trying to get a picture of her dimples and the smile that makes me melt, I inevitably get 90% of her eating her fingers, 9% of her one eyebrow cocked "What are you doing face?" and 1% of the smile I've been hoping to capture. Think I'm exagerating? How about this grouping taken the next day, I never managed to get the smile and she was soooooo squimry. That's my baby girl, open mouth... insert fingers. I thought for a while about going with a nickname, but I'm opting not to for now. Mainly, if she does have people google her when she is school aged and they somehow find out about the blog anyway, they're more likely to tease her with the nickname. So, my baby girl's name is Kirsten. We opted for the Swedish pronunciation, which sounds like Keerstin.